It's hard to see but her shirt says "my little turkey". She was a little bewildered with all these people sitting down for dinner but enjoyed the attention of her adoring fans. Attention those of you on my Christmas card list...please try to act surprised. We had a great time. Now, the holiday season is in full swing. Happy Holidays! Just stopping by to wish everyone a very happy Thanksgiving tomorrow. Once again, I'm not cooking, which is absolutely mindboggling to me. We'll be at Kelly's. I am baking pies, however. Pumpkin, apple and pecan pies will be dessert tomorrow. 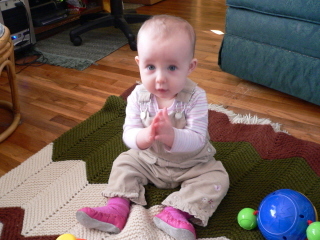 It's Lorelai's first Thanksgiving and, as you know, pictures will be forthcoming. It's Sunday evening and I'm relaxing after spending most of the weekend with Lorelai. Yesterday, Kelly and Mike went to Laura Meade's wedding so Lorelai stayed with us for the afternoon. I brought her over to their apartment in the evening so I could put her to bed. 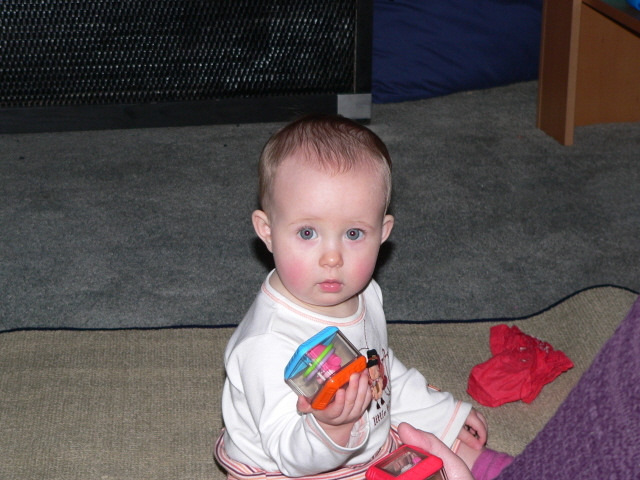 Then, she was here for our usual Sunday while Kelly was at work. We kept her busy, out shopping for the afternoon. She's quite a character. 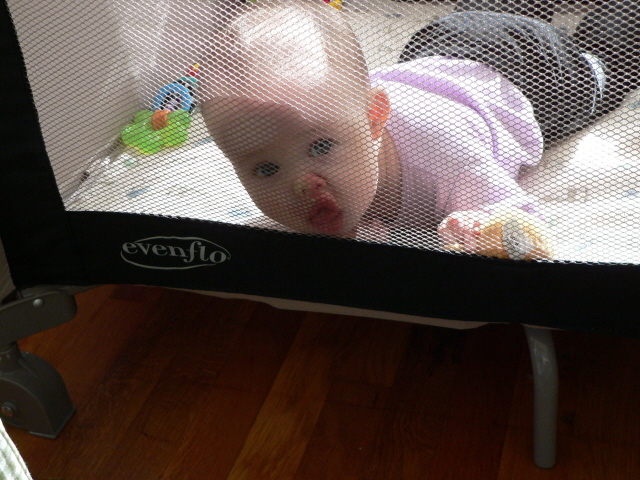 This bit of action in the playpen made me grab the camera. I sized these pictures bigger so I could email them. She kept squashing her face against the mesh. She thought it was really funny when I laughed. Here, she looks like she's a captive. She's so much fun now. I love this age. Even if she gets a little bored, it's so easy to distract her with another toy. 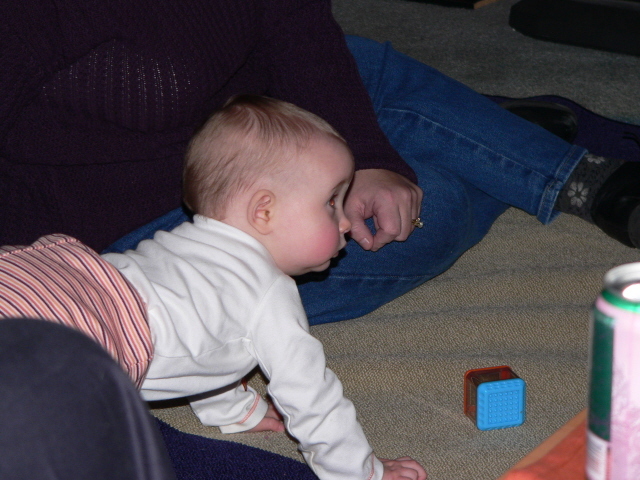 Never mind that she saw that same toy ten minutes ago. It's still something different. Ah, if it could always be that way. I finished my wool mittens and I lined them with fleece. I love them. I made a pattern on paper, just tracing around the mitten. Then I added a seam allowance and cut out fleece and sewed it together, trimming excess fabric from the seam. Then, I slipped the fleece mitten inside the wool mitten and blanket stitched the fleece to the wool. I didn't extend the fleece all the way to the end of the cuff. 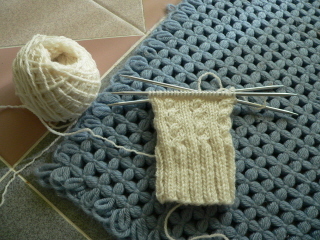 I stopped it at the beginning of the ribbed cuff. I didn't think it was necessary there since that part usually is inside my coat. 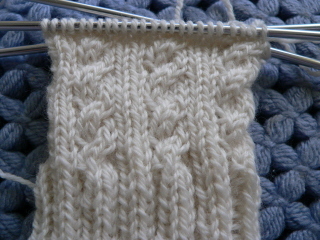 This way, the ribbing would still stretch as much as usual. I just wanted the fleece to line the hand and thumb part of the mitten. I think they'll be really warm and it couldn't have been easier to do. I was hoping to finish these before the weather turned cold and it's finally beginning to feel seasonable. It's hard to believe Thanksgiving is upon us when it's still been so warm. I hope it stays like this for awhile, before it becomes really cold. Have you all seen this? If you haven't clicked on the link, it's the interview and book deal by O. J. Simpson. This whole situation positively blows my mind. How horrifying is this? FOX, Simpson and TV in general have sunk to an unbelievably new low. Since he can't be tried a second time, it's such a slap in the face of the families of the victims. I'm sure the money will be in trust for his children (where there will be some loophole allowing him to spend it) so the Goldman family can't collect it. Speaking of the children, how can he face them? On that note, I'm off. Relaxation is in order for the evening. Ta-ta. Pooh is sad. Yes, winter has some really nice holidays but it's cold and we have to wear warmer clothing. Ah well. 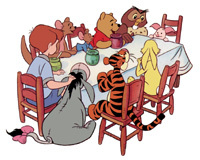 Cheer up, Pooh. 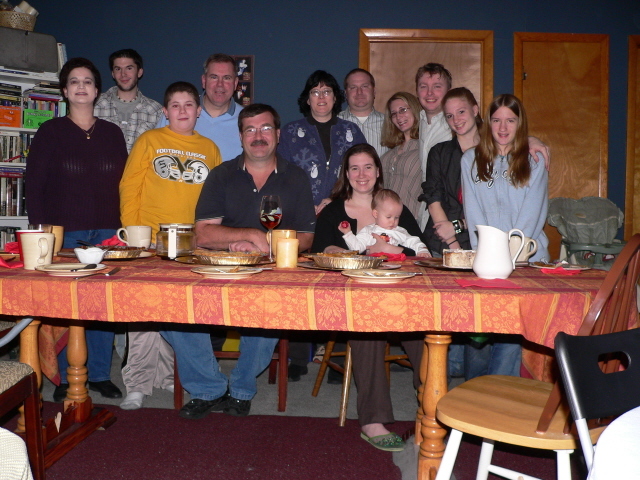 Thanksgiving's almost here! I'm quite happy with it. It was so much fun to work on and even though the leg part looks narrow, it really does fit well. Here, I'll prove it to you. 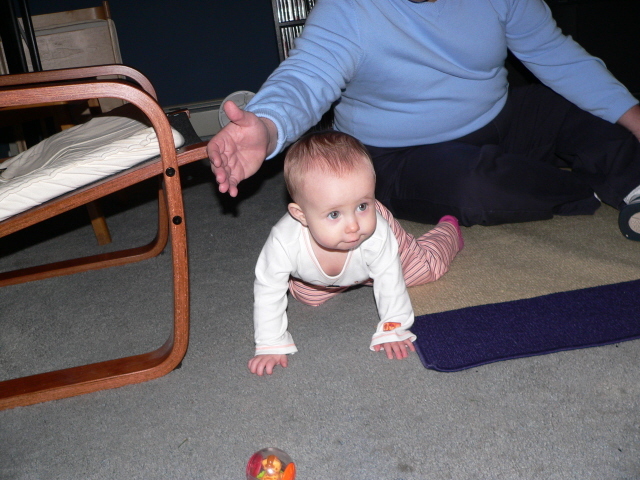 Yep, that baby can stretch and it's really comfortable. I'll block it once the second one is done so the stitches will be nice and even. 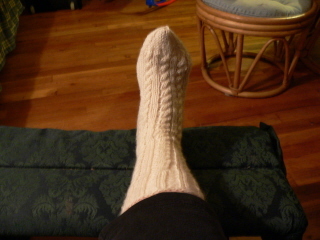 Here's a detail picture of the heel. 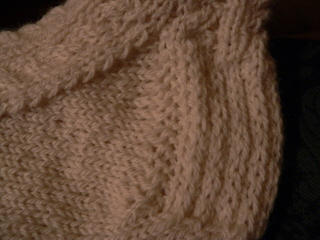 I love the little garter stitch border at the left side of the heel stitches. It doesn't take much to make me happy. I feel like I'm fighting off a cold but it doesn't seem to be a bad one. My throat is just barely sore and I've been sneezing but it's no worse than dealing with allergies. I am a little tired, though. Last, but certainly not least, I wanted to mention the fact that it's Veteran's Day. I know these holidays usually mean you get sale flyers from electronics stores but these days, we need to remember the veterans, and those who are fighting for us today, more than ever. Last night, Sue and I interpreted Sunday In The Park With George at Smithtown. Most of it wasn't that difficult. We had it worked out well as far as the division of the characters. I think the only really hard part was Putting It Together. Wow, it's long. I was interpreting George and it was hard to hear his part over all the talking in the background. So, I missed a couple of lines here and there because I didn't have it memorized. But, all in all, it went well. I can't believe we have to wait until February to see what happens on LOST. Those writers certainly know how to manipulate your emotions. Holy cow. I finished these socks the other day. Now I have two more of the five to complete. Of course, even though I told myself I wouldn't start any new socks until I finished the last two, I caved in yesterday and cast on these. 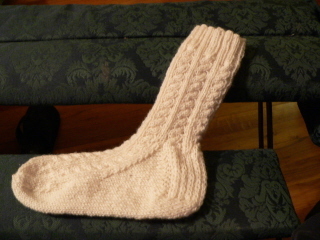 Cable knit socks. Can you blame me? This is the same wonderful yarn from Gettysburg (the cuffs of the handspun sweater, the one mitten waiting for a mate...) and a pattern I've wanted to try. Now that I've made several pairs of socks and understand the construction, I think I'm ready to move on to something more challenging. I've done cables before, although these are smaller than what I've done before. These will look so much better after they are blocked. But I love them already. I really do have to make an effort to finish more items. I'm beginning to feel a little overwhelmed by the number of projects I've started. 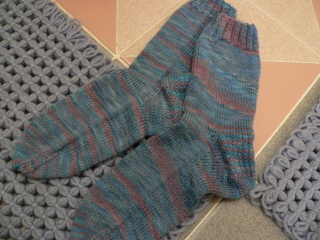 Well, I did finish a pair of socks. I can do it when I try! I also have some sewing I'd like to tackle, maybe next week. Bill and I celebrated our birthdays this week. We had dinner with the family on Tuesday evening at Outback. I forgot to bring the camera. That's the only reason I have no pictures! Bill got a couple of new golf clubs and I got a new iPod; both gifts were chosen by the recipients. We rarely buy each other something and wrap it. We usually discuss what we'd like and then pick them out, usually online. We couldn't do much on our actual birthday because I had to teach that night (and I STILL don't have my books!). Bill flew to Florida with his golfing buddies yesterday and will return Saturday night. Sounds like they have nice weather and are enjoying the golf. 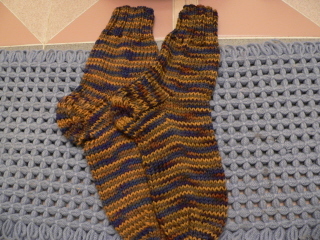 Well, in my quest to finally complete my five pairs of socks, I present the latest pair. I like this pattern. 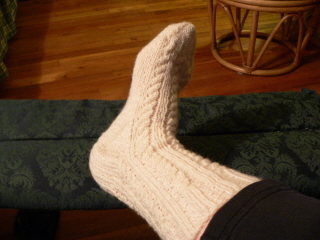 It's the classic sock pattern from Nancy Bush's book, Folk Socks. This pattern seems to fit me the best. I bought this yarn online from Hello Yarn. The picture doesn't do the color justice, as usual. It's a turquoise blue and purple color and this yarn is so soft and comfortable. I've started knitting mittens and I'm trying some new things. 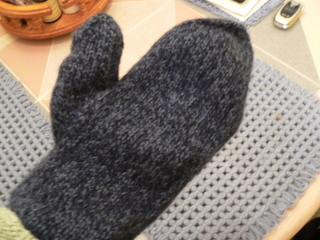 I made one mitten from the beautiful Australian homespun I bought while in Gettysburg. It's fine just the way it is but I'm wondering if I can make these just a little warmer. 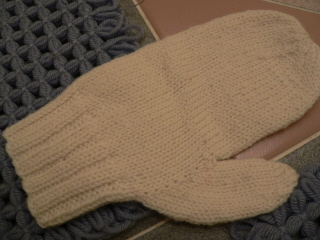 I had a pair of gloves from Old Navy, knit from what looks like this type of wool. The gloves were lined with fleece and they were so warm. They finally got holes in them and I'm thinking that if I line these mittens with fleece, they'd be really cozy. I can give it a try. but the inner mitten fits me perfectly. The outer mitten is meant to provide extra warmth and the inner mitten fits inside it. It's actually pretty comfortable. 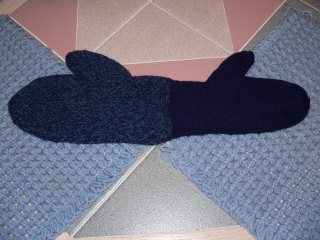 Now, I just have to make the other mittens to match. Ah, second mitten syndrome. Hmmm? I hope these lined mittens are warm. My fingers get so cold in the winter. 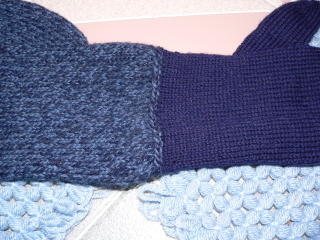 Here's the detail of the join between the mittens. 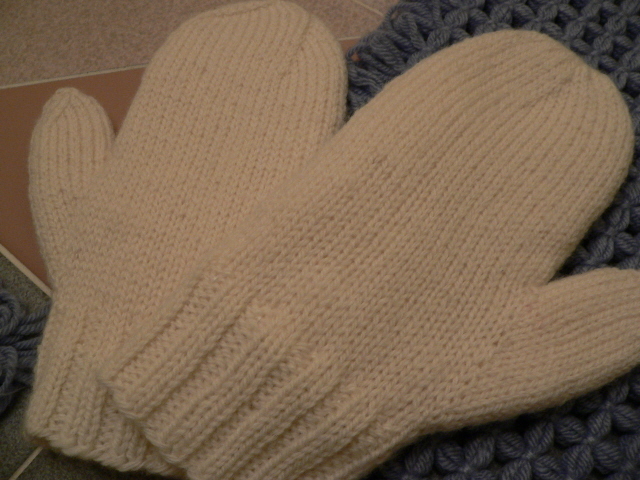 Both these patterns (classic mitten and lined mitten) are from the book, Folk Mittens by Marcia Lewandowski. The blog wouldn't be complete without some Lorelai. 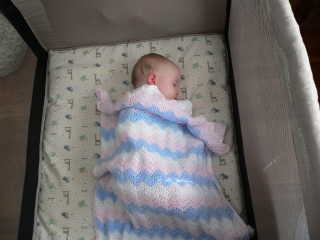 She does sleep in the crib/playpen now. In fact, we've gotten into a pretty decent Sunday routine these days. She usually naps about the same time, around noon. 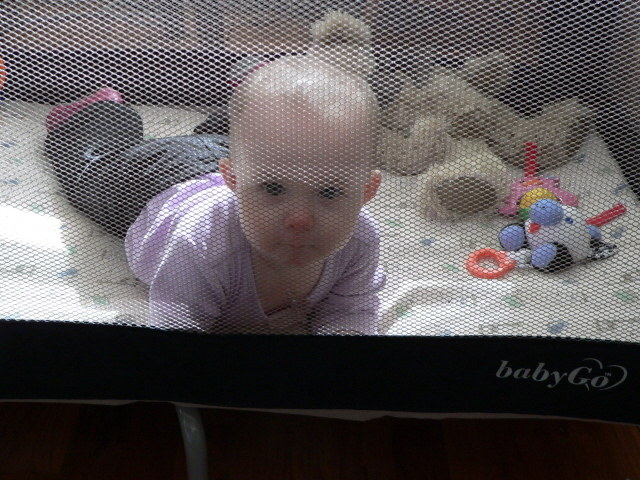 She likes to play on a blanket on the floor but she will play in the crib/playpen as long as she can still see me. 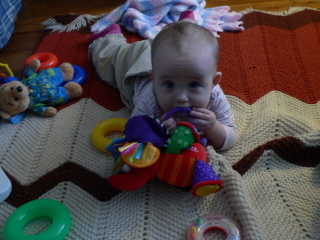 She has a pretty good collection of toys here now, too. The cooler weather seems to be staying around. For awhile, it would be cold one day and practically balmy the next. Now, I'm wondering when the Christmas music will begin playing nonstop on one of the radio stations. It's that time of the year! 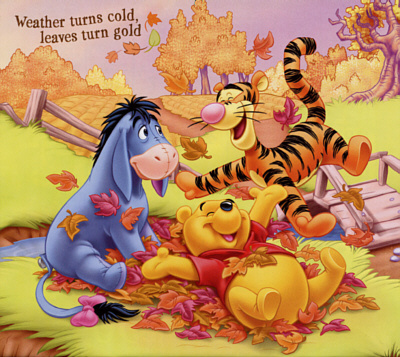 Greetings, all, on this lovely first day of the month of November. 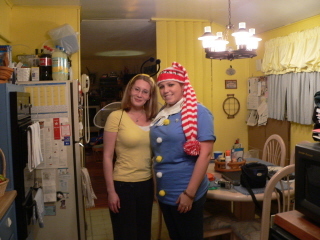 Kim and Krystal (or Bumblebee and "Crackle"). This is the stocking cap along with the rest of the costume. So cute!